'Acapella' is the first single released from Kelis' upcoming album 'Flesh Tone' due out this summer. 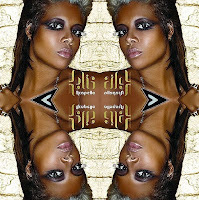 Kelis collaborated with David Guetta to create a sound that's definitely different from what we she's done in the past. Much of it having to do with her signing to a new record label Interscope Records last year. Kelis stated on her website "I signed a new deal and I'm madly in love with life and ready to share something with you." Watch Kelis' colorful and artistic 'Acapella' video below. It's very different I like her makeup, but whats with her hair?